Beginning July 9, 2014, surveyors, engineers, and environmental scientists began gathering information about the condition of College Lake and College Lake Dam. This investigation is a result of an engineering study conducted on behalf of the City of Lynchburg to comply with new dam safety regulations that identified deficiencies with the spillway at College Lake Dam which is located on Lakeside Drive near the entrance to University of Lynchburg. The study determined the spillway is not large enough to handle the flow of water which could be expected during extremely severe weather conditions, creating a potential safety hazard for those who live below the dam. Check out media coverage in The News & Advance and on WDBJ-7. This investigation will include conducting topographic surveys, drilling test holes, taking soil samples, determining wetland boundaries and conducting underwater investigations. The results of these tests will reveal important characteristics of the lake, dam and the underlying soil, yielding data that will be useful in making future engineering decisions. 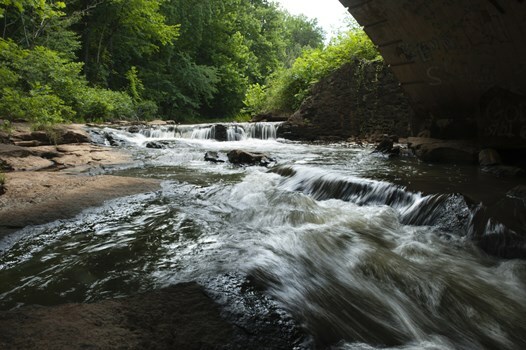 Together, the City and University of Lynchburg are investigating potential solutions and changes to the dam and adjacent areas, including strengthening the dam, removing the dam, creating a smaller lake bed, re-engineering wetlands, creating a forebay to help with ongoing sediment removal, restoring the stream to pre-dam conditions, and creating a pedestrian crossing under the roadway. Representatives from the following companies will be gathering information in the area of the lake and dam; URS Corporation, Wetland Studies and Solutions, Inc., Precision Measurements, Inc., Crofton Industries, and Triad Engineering. College Lake Dam was built in 1934 by the Virginia Department of Highways (now VDOT). The dam is 35.4 feet high and about 300 feet long with a 60-foot spillway. College Lake drains 22 square miles, mostly in Lynchburg with a small portion draining in Campbell County.